“Let the true, the beautiful and the good be the objects of your constant admiration and aspirations . . . "
Howell Edmunds Jackson, 1832-1895. Associate Justice, Supreme Court of the United States, 1893-1895. 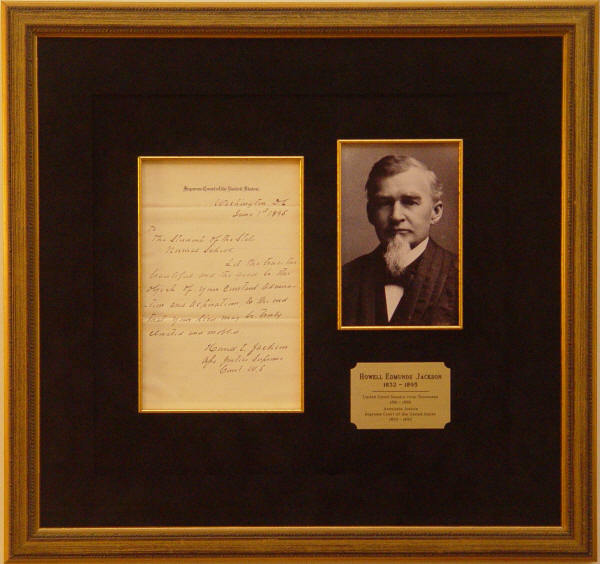 Extremely rare Autographed Letter Signed, Howell E. Jackson / Asso Justice Supreme / Court U.S., one page, 5" x 8", with integral leaf attached, on engraved stationery of the Supreme Court of the United States, Washington, D.C., June 1, 1895. A little more than two months before his death, Jackson pens advice to college students at the State Normal School at Emporia, Kansas, now Emporia State University. He writes, in full: “Let the true, the beautiful and the good be the objects of your constant admiration and aspirations, to the end that your lives may be truly elevated and ennobled." 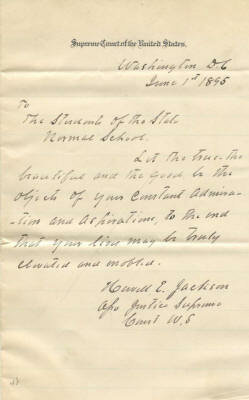 This is the only letter by Jackson as a Justice that we have ever seen. Jackson's autograph material is rare enough as a general proposition, but, because of his early death, his time on the Supreme Court was only 2 years, 5 months, and 21 days. Our search of auction records shows no other Supreme Court-period letters by Jackson sold at auction in more than 37 years. 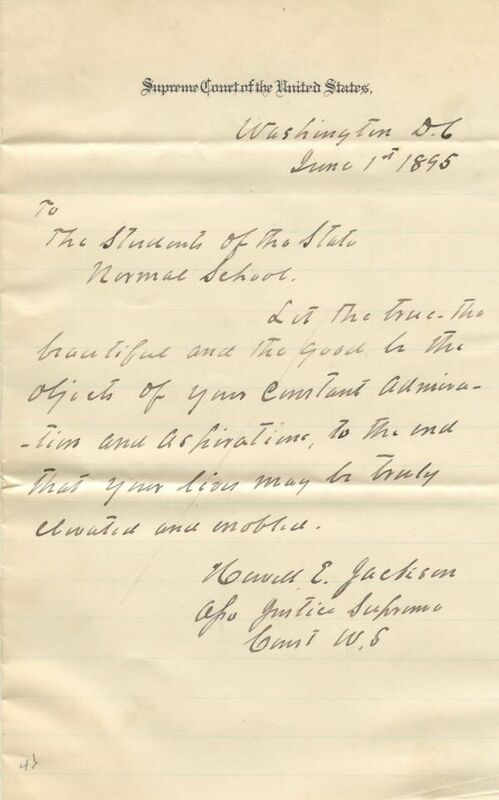 The only other Jackson letter that we found was dated 1881, predating Jackson's 1893 appointment to the Supreme Court, which sold as part of a large collection of Supreme Court letters and documents in 1999. Jackson has penned this bright, clean letter boldly in black fountain pen. There are archival repairs to a ¼" fold split and to a missing upper right corner and small tear at the lower left corner of the integral leaf, none of which affects the text, signature, or appearance of the front leaf. There is a small collector's pencil notation at the bottom left of the front leaf and a light pencil line through the text, not affecting the signature. Overall the letter is in fine condition. The letter has been elegantly double matted in carbon black suede with an inlaid gilt wood fillet, a portrait of Jackson, and an engraved brass identification plate. It is framed in a gilt wood frame to an overall size of 18" x 17". about our custom preservation framing.